I decided to stay up on Friday night to make her a dress. After much searching online, I finally found a tutorial that I wanted to use HERE. Since I'm a novice sewer, I really find online tutorials to be pretty easy and straightforward for me. This tutorial was perfect for me. The only major problem I had was remembering how to do buttonholes again since the last time I did a buttonhole was in junior high school. The buttonholes still came out messed up, but luckily, the knots hide them. I made the 4/5 size from the tutorial and decided to criss-cross the back instead since it was slightly too large on Isabelle who only wears a size 3 now. I figured it would always be better to be slightly too big than to be too small. The length was great though. It came down to her mid-calf which looked great. 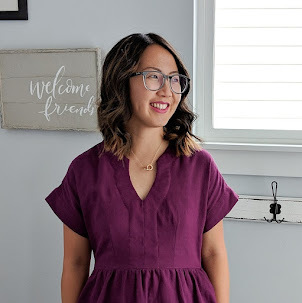 It took me about a good handful of hours to complete this dress, but I love it and I will definitely be using this tutorial again for future dresses. That is one of my favorites I've seen made!! You did an awesome job. The fabric is adorable and your little model is even more so. Thanks for sharing it with me.